Doug Nicholls was undoubtedly one of the most important Australian Rules footballers of all time, but he receives little official recognition by the Australian Football League (AFL) and is not a member of the Australian Rules Football Hall of Fame (AFHoF). During the era of the White Australia Policy (1901-1972), Doug Nicholls was one of the few indigenous players to overcome the barriers and succeed. During this period, some indigenous people downplayed their identity to reduce the problems they otherwise faced. Doug was different. He won respect as a footballer from the white crowds, and used that hard won identity to campaign for indigenous rights within the football community and more broadly throughout Australia. The Australian Football Hall of Fame (AFHoF) was established by the AFL in 1996 to recognise people who have made a significant contribution to the game since its inception in 1858. The Hall of Fame includes footballers, coaches, media personalities, administrators and umpires. But what makes a significant contribution to the sport? Is it long service in a paid job? Is it the number of games played, or some other quantifiable statistic? Or could it be that through football someone changed what was acceptable in the game and in society? The American baseballer Jackie Robinson acquired mythological status in American baseball by being the ‘first’ (which he was not) black player in the professional game. To survive this experience, Robinson suffered and endured much. Most Americans admire his achievement as something important. Robinson changed baseball and changed America. Is such a contribution to a sport worthy of recognition by a Hall of Fame? For many people it is. Cummeragunga fielded a strong indigenous football team which often played teams from the local Echuca region such as Echuca, Echuca East and Rochester. Young Doug was captain of the Cummeragunga school football team before joining the otherwise white Tongala football club (who played in the Goulburn Valley Football League). As a player Doug was small and fast, only 157 centimetres tall. (He was eventually to be recognised as the all-time shortest Fitzroy Football Club player - equal with Barclay Bailes - and only two centimetres taller than the all-time shortest player, Jim Bradford of Collingwood/North Melbourne). In 1926 Nicholls came to Melbourne to make his mark as a professional foot runner.2 Over time he would win more than 1,000 pounds as a foot runner. His biggest wins came in 1929 when he won the Warracknabeal Gift and Nyah Gift. Professional foot running was a seasonal (summer) sport, so Nicholls, already recognised as a good footballer, played football through the winter. Nicholls believed racism to be the reason he was not selected at Carlton. Stories have been written about this episode. They variously note that Carlton's trainers would not rub him down, that people said he smelled5, or that he was not allowed in the rooms.6 It should be added that Nicholls was not known for exaggerating racism and often played down the racism he himself actually faced. With VFL access proving difficult, Doug Nicholls sought a home with the Victorian Football Association (VFA). In 1927 Northcote Football Club in the VFA sought a new wingman to compensate for the loss of Tommy Downs, the 1925 Recorder Cup (VFA) winner. Downs left Northcote and filled the role at Carlton that Nicholls had wanted. Downs was a fiery character, and over the next years at Carlton he was suspended for 60 games - and played only 56. Nicholls was immediately in the Northcote senior team. He played his first game at Brunswick in May 1927. The Argus listed first-gamer Nicholls as one of the best Northcote players on the ground.7 Initial success did not falter, and Nicholls became a regular in the Northcote side. Doug’s success meant that his brother joined him at Westgarth Street in 1928. Often forgotten, as the VFA played so few interstate games, is the fact that Nicholls twice represented the VFA as a representative player, both times in 1931 (against NSW in Sydney, and against the VFL at the MCG). In short, the fast paced wingman had become a VFA star. Around this time Ross Faulkner, a committeeman at both Northcote and VFL club Fitzroy, changed the name of his most popular footballs to ‘Native Brand’, in recognition of the efforts of Doug Nicholls. Faulkner's influence may also explain why Nicholls transferred to Fitzroy rather than to another VFL club. To finish the Northcote story: Doug Nicholls would eventually play seven seasons with the VFA club (1927-31;1937-38). Later, in 1947, he was appointed Northcote’s senior Coach. As far as this writer can ascertain, Nicholls was the first indigenous coach in any major football competition in Australia, again pushing football boundaries. Doug's first VFL game was Fitzroy's Round One win against Carlton in 1932. (Between 1932 and 1936 he would play 54 games for Fitzroy). As a small player in the rough 1930’s game, Nicholls did not survive unscathed. In 1933, he was knocked unconscious and carried from the field during the second quarter of a game against Richmond. He was still unconscious when the third quarter began.13 In August 1934 Doug injured his knee in a game against Mooroopna.14 In 1935 he tore a thigh muscle and this put him out for a number of games at the end of the season.15 He quickly developed a reputation as a tough but fair player. In 1934 Nicholls began studying to be a missionary and Pastor. Religion was becoming important to him, but he was also drawn to the Church because it was then one of the few avenues available for advancement. In Black America and South Africa, people who wanted to speak out against social injustice also used the church as their platform. It is clear that it was more than religious zeal driving Doug down this path, as he was soon using the Church to campaign for the betterment of the conditions of indigenous people. This must have been a fine balancing act. Nicholls wanted to change the opinions of White Australia while still playing football. Already a popular footballer, he spoke in churches widely throughout Victoria. He had become famous for his dignity and fairness, and this at a time when football’s reputation for violence was at its height. In 1935 Nicholls was selected in the VFL team to play in Perth and Adelaide. A widely popular choice, Doug joined the team on what was an extensively reported trip. Newspapers introduced the new star to their local audiences. A number of articles included an interview with Nicholls and reported his comments about the trip across the Nullarbor Plain - 'I saw some of my people, and I can only say that their lot is tragic. When I return to Melbourne I intend to bring their condition under the notice of the proper authorities. Their living conditions could be a lot better. '17 For many years Doug Nicholls was one of the few non-white persons in Australia able to talk about social issues where the message would be reported. In 1936, with their own local boy Nicholls at the height of his football fame, the Cummeragunga football team proposed an exhibition match against the VFA. Nicholls, already speaking out against the conditions of aboriginal people, could only look on as Councillor Griffen (Port Melbourne Football Club) said such a match would ‘make a burlesque out of the Association’. 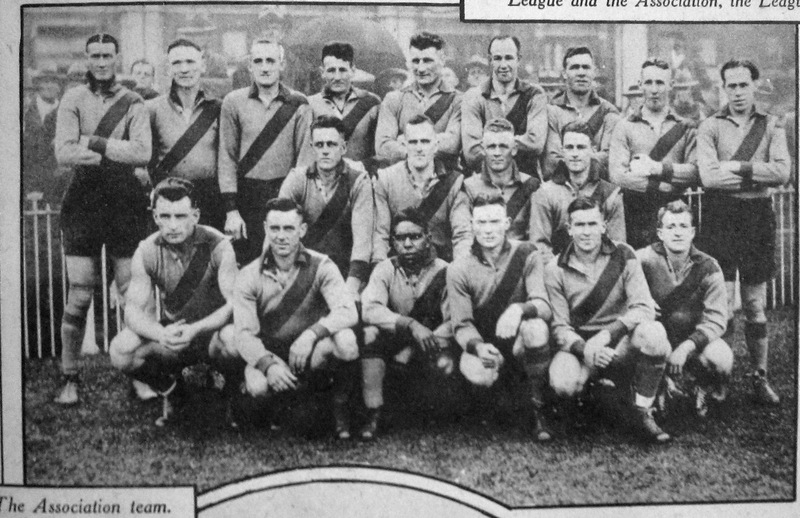 The VFA decided to take no action on the matter.22 (In 1944 Nicholls led an indigenous All-Star side against Northcote in front of 10,000 people. Councillor Griffen’s comments would not have been forgotten). By 1938, after eleven years playing at an elite level, Doug's playing career was finished, but this did not end his connection to football. As with so many ex-football stars, the game would remain part of his life. Doug would be regularly stopped by people wanting to talk about football. Nicholls confronted wider issues than just football. Throughout the 1940's, 1950’s and 1960's his voice became an important one in the fight for aboriginal rights. Nicholls had a politician’s memory for names, and his football connections and fame opened many doors. In the late 1960’s Doug Nicholls was appointed inaugural chairman of the National Aboriginal Sports Foundation (NASF). Throughout this period he became an important administrator and patron. He helped to organise the first aboriginal Sports Carnivals, providing interstate football competition for aboriginal teams. According to the authors of a biography of Carnival organiser Alick Jackomos, the VFA's support for the 1973 Carnival was due ‘no doubt because of Doug Nicholls’ and his involvement as Patron.29 Carnival teams also played for the ‘Sir Douglas Nicholls Cup’. The NASF's Sports Carnivals continued and were held in Canberra (1974), Tasmania (1975), Alice Springs (1976) and Adelaide (1977). Importantly, after the 1973 Carnival, an All-Australian indigenous team was selected to play in Papua New Guinea, with Nicholls again as Patron. The reputation Doug Nicholls built in the wider community, a reputation for fairness and kindness, was initially won on the football field. While still playing football, Nicholls spoke out on indigenous issues and became one of the strongest advocates for aboriginal rights in Australia. Further, many people were influenced, in their opinion about football, by Doug's community standing. Locally, within indigenous football, his involvement was also profoundly important. It can be difficult to appreciate the extent of racism in the white culture of 1930’s Melbourne. The full extent of the impact Doug Nicholls achieved as a prominent black man is therefore easily overlooked. Racism reached a high level in the 1930's. In Germany, the United States, and South Africa, segregation and apartheid reigned supreme. In Australia, indigenous Australians were not immune. Many aboriginal people required permits to travel. Many were banned from drinking alcohol, and from practising law. Many aboriginal families were forcibly broken apart by white people, creating a whole ‘stolen generation’. It is difficult to know how much sledging occurred on the football field in the thirties. Considering the experiences of recent indigenous footballers, it is reasonable to assume that Nicholls copped heavy racial abuse while playing football. If that was so, Nicholls faced the same dilemma that Jackie Robinson later faced in American Baseball. He would have been forced to accept years of abuse from opponents and crowds with little practical ability to fight back. If Nicholls did endure abuse on the football field, his campaign at the same time for aboriginal rights off the field shows his great character. Off the football field in Australia, aboriginal footballers were treated differently than white footballers. In 1948, the former South Fremantle aboriginal player Billy Hayward was hauled to court and fined for receiving alcohol, his half drunk glass of beer being brought into the court as evidence.35 In 1954, the Canberra Times reported that Bruce Pott, another aboriginal footballer, had been sentenced to fourteen days jail for drinking beer.36 The report clearly stated his gaol sentence was not for drunkenness, rather for mere possession of alcohol. Pott waited three nights in prison before even being sentenced. Sadly, the newspaper explained how this was an even worse miscarriage of justice as ‘Pott was reared by a white family as a white man and has a white man's job and pay’. One of the most famous stories written about the great Fitzroy footballer Haydn Bunton is also one that sheds light on the football experiences of Doug Nicholls. The story is that when Nicholls joined Fitzroy, he was changing by himself in one corner of the dressing room. Haydn Bunton approached Doug and asked why he was changing away from the other players. "We-e-ll", said Doug, "You know how it is...". And from that moment on Haydn Bunton was always alongside him in every dressing room.37 The story is usually told to acknowledge the humanity of Bunton, but what the story also shows is that Doug Nicholls - already a hardened professional, having played five seasons with the strong Northcote side - had faced racism in the change room for years. Clearly Nicholls lived in a society where skin colour affected a person's daily life. Doug stood up to racism in his sport, not with a single action, like Nicky Winmar, but with years of campaigning and action - against a level of racism difficult to imagine in today’s Australia. The parallels between the experiences of Nicholls and those of famous black American baseballer Jackie Robinson are hard to ignore. Enlisted in the Army in World War Two. Served for around six months before being asked to work with the aboriginal community in Fitzroy. Ordained as Churches of Christ Pastor in 1945. Director of the Aborigines Advancement League. Victoria’s second-ever aboriginal Justice of the Peace. Crowned Melbourne’s 1973 'King of Moomba'. Appointed Governor of South Australia (1 December 1976) but poor health made the appointment difficult to perform. Sir Douglas Nicholls died in 1988 and is buried at the Cummeragunga Mission cemetery. In 2007 a statue of Sir Douglas and Lady Nicholls was unveiled in the gardens behind Parliament House, in Melbourne. In 2005 the 'Sir Doug Nicholls Cup' was established in memory of his achievements. It is now the perpetual trophy played for in matches between AFL representative teams and teams of Indigenous All-Stars. An All-Stars side defeated the Western Bulldogs in 2005 to become the first holders. The trophy was lost to Essendon in 2007, but won back again against the Adelaide Crows in 2009. In 2013 the All-Stars defeated Richmond. They were captained on this occasion by Nathan Lovett-Murray (Essendon,145 games, 2004-), the grandson of Doug Nicholls. All senior football competitions in Australia now recognise, and benefit from, the large number of indigenous players involved in the modern game. Also, the list of Indigenous players who participated at a senior level in the past continues to grow. Today, Joe Johnson (55 games, Fitzroy, 1904-06), Alf Egan (51 games, Carlton, 1931-1935), and others, are recognised as having begun their VFL playing careers earlier than Nicholls, though it must be noted that, in their own time neither Johnson nor Egan was identified publicly as being aboriginal. Recently, Carlton Football Club historian Tony De Bolfo has added Cyril Mann to the list of early indigenous footballers. De Bolfo confirmed with Mann’s family that Cyril's grandfather was William Cooper, another great activist from Cummeragunga. 41 Cyril Mann played 42 games for Carlton (1939 - 1942, 1945). The fact that the list of indigenous names continues to grow in this way indicates the football community as a whole has become more aware and more mature. Nevertheless, it also makes it harder for modern football followers to appreciate just how ground breaking and courageous the VFL career of Doug Nicholls actually was. For many years he stood alone in the spotlight. In May 2013, it was revealed that Doug Nicholls was on the short list of candidates for the next sporting legend statue at the MCG. AFL Community Engagement Officer Jason Mifsud was one of those supporting that push.44 This potential recognition of Nicholls at the MCG, as an iconic Australian sporting legend, is clearly in contrast to the absence of his name in the hundreds already recognised by the Australian Football Hall of Fame. The fact that the Australian Football Hall of Fame does not include Doug Nicholls must be seen as a glaring absence. One must accept that if Nicholls had been white he would have had far more opportunities. Importantly, Nicholls did not throw in the towel when rejected by Carlton: he starred in the VFA, forced his way into the VFL with Fitzroy, and then earned interstate representation. Nicholls also used his football fame as few others have done, and used it to campaign for aboriginal rights. His reputation, character and example were very well-known in the 1940’s and 1950’s, and there can be no doubt he blazed a path that others would follow. For the Hall of Fame selectors to induct Doug Nicholls, they would need to recognise an intangible contribution that cannot be measured in the number of games played, or number of goals kicked. Oddly enough, these intangibles of “integrity, sportsmanship and character” are clearly written into the criteria for selection of candidates for the Hall of Fame. What makes a significant contribution to Australian Rules Football? I say, look at Doug Nicholls.